It's a perfectly still morning at Two Rivers Lake in Rocky Mountain National Park. More often than not the wind blows strong down the flanks of Flattop and Notchtop Mountain making reflections difficult. After raining hard the night before, I hiked into Two Rivers Lake pre-dawn with clouds still filling the sky. The prospects for the sun to break through at sunrise seemed small. While waiting along the shores of Two Rivers Lake with my camera setup, the grey drab landscape quickly moved to an explosion of color over Notchtop Mountain. 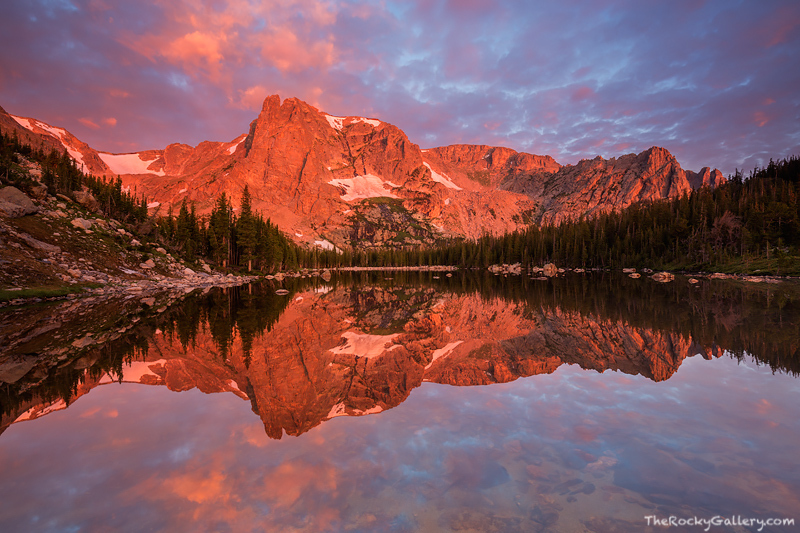 The still waters of the Two Rivers Lake made for a perfect reflection of both Notchtop Mountain and the colorful morning sky above the peak. Photo © copyright by Thomas Mangan.